and the Christian position is….God exists and has revealed Himself to us through the Jewish prophets and especially through Jesus Christ. If you go with the Christian position and are wrong, then nothing is lost. If you go with Dawkins or Einstein and are wrong, then you have missed the incredible experience of knowing and loving God. You may be afraid to let God into your life. This might mean a change in your lifestyle. But God offers an inner healing, and a peace and joy that the world cannot give. If you seek God with all your heart, you will find Him. The Rite of Christian Initiation of Adults offers free classes open to all, even if you just want to know more about the Catholic Church. You will find spiritual nourishment and fellowship. If we live selfish lives, don’t be surprised if God seems distant or irrelevant. But if we try to help the needy and the hurting, we have a much better chance of finding God. Is there a person in your life that needs your help? Many places in the Bible show that love of neighbor... doing what we can to help others... will always be important in finding God. Don’t look for thanks. Often you will not find it, or it may come later. Finding God is your reward. This involves taking time away from your regular activities to find out where you are and what you are doing in your spiritual journey. You examine your relationship with God and with others. Then you decide what changes are needed. Spending time alone with God becomes a priority. Now prayer gains new meaning and importance in your life. You experience a closeness to Jesus Christ. Focus: marriage, loss of loved one, addiction, faith, etc. As you enter Saint Mary's Church, your eyes adjust to the dim light. You are standing at the start of a long aisle leading to the altar. A few people are silently praying in the pews on both sides of the aisle. You sense God's presence and you know that He is near. 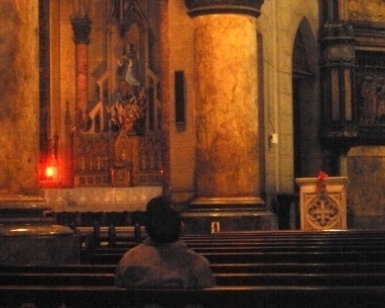 As you walk down the aisle you notice a red light above the main altar. The light indicates that Jesus is here. Now you recall Christ's words: "Come to me all who are heavily burdened and I will give you rest." Then you let Jesus know what else troubles you and ask Him to help you. Let words of praise, thanks, and love flow easily from your heart. Now you sense the need to be silent, to wait on the Lord. Words are no longer necessary. Being with Jesus is enough. Before saying goodbye, you pray for others, including relatives and friends who are hurting. You thank Jesus for this special time together. Then you pray a Hail Mary prayer to honor Mary, the Mother of Jesus.